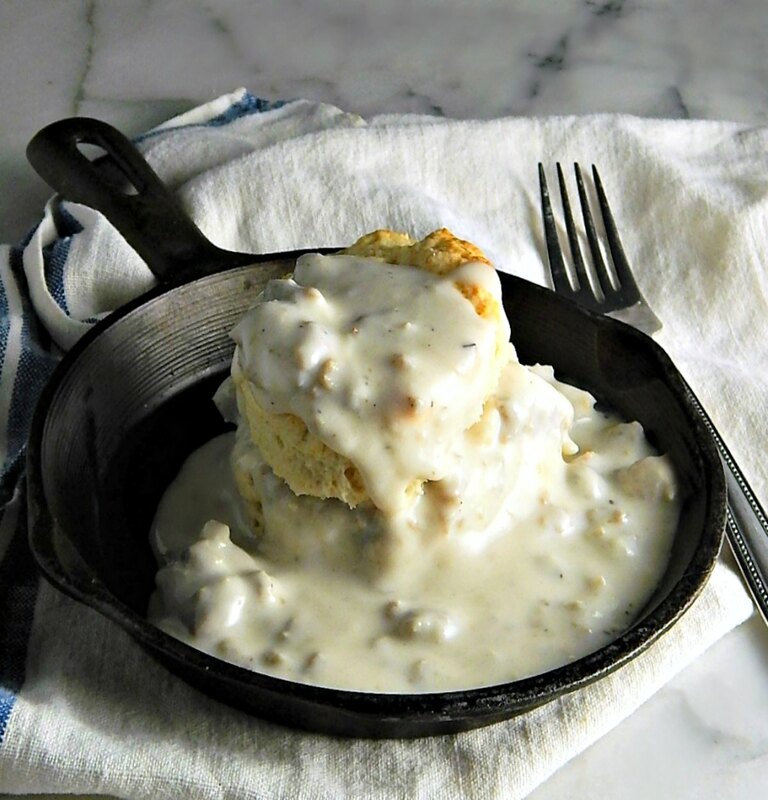 I can’t believe I’ve been blogging for years and have never posted my Classic Biscuits & Sausage Gravy. I think it’s because I have a little angst about the dish. It’s so good and I’m crazy about it, but I try not to eat it too often. Actually, though, with today’s leaner pork and sausage it probably isn’t as bad as I fear, but I’m still not going to run the nutritional numbers. I’d rather be happy and ignorant! Sausage Gravy is called Sawmill Gravy in some parts of the country, and in other areas, it’s just called Sausage Gravy. It’s really a “Country Gravy” coz it’s made with milk, cream or a combo instead of stock. It’s the same gravy, with just a few minor changeups, that you’ll see used on Chicken Fried Steak, only when used in Classic Biscuits and Sausage Gravy, the Country Gravy is made with sausage as the base instead of drippings. Country gravy is super simple to make: Cook the sausage through, sprinkle it with flour and add milk. And pepper. Lots and lots of pepper. It’s really what makes the sausage gravy so great. Some people add a touch of cream to the gravy but I generally just use milk, usually whole milk. A lighter milk will work but the gravy just won’t be quite as rich and will look a little anemic. As a matter of fact, if your sausage is super lean, you might need to add just a little oil or butter to make that roux (the flour/fat mixture that’s the basis of the gravy.) Don’t be disappointed if your gravy isn’t pure white like you might often see. The sausage should pick up some flavor from the bottom of the pan the sausage is cooked in and that is going to give you a bit of color. I’ve gotten rave review over these simple biscuits. I love them because they’re not buttermilk and just use plain old milk which I pretty much always have on hand. They rise super high (that’s one biscuit in the pan, covered with gravy) they’re absolutely soft, tender and flakey and they have just a bit of a crustiness on the top that’s very appealing. Speaking of appealing, you can literally peel off layers if they’re made right. The layers aren’t as dramatic as say, the canned versions, but there are definite layers. I try other biscuit recipes all the time, but keep I going back to this one. But these biscuits have a deep, dark secret. I just hate giving out the recipe because people freak. They judge. Some people even make you feel a bit ashamed. You might have guessed already. These biscuits aren’t made with butter, they’re made with shortening. I can count on one hand the items I use shortening for (Snickerdoodles are one) but the shortening is what is responsible for the wonderful texture of these biscuits. What you’re going to miss, obvs is the buttery flavor – surprise: most people don’t really notice unless they already know, especially when these biscuits are served with butter or smothered in gravy! If you must use butter, increase the amount of butter over the shortening and add an extra tablespoon. Our American butter has more water than shortening does so you’ll need to make up that missing fat. This is NOT an expensive meal to make, that’s for sure! The homemade biscuits are super easy and take just a few minutes to make and come in at a fraction of the cost of buying the biscuits in the tube. I’m always a little shocked at how much those cost, even the “store” brand. Shortening really isn’t less than butter, but these biscuits use a third of a cup, which is less than most biscuits. Make sure to buy shortening, not “whipped” shortening. Do look for sausage on sale, especially around holidays. Pick it up and stash it in your freezer. It may even be already in the frozen section. I like to look for the “off brands” rather than the big name brands. I remember, actually, when Jimmy Dean was an “off brand”. Not only are the “off brands” usually less expensive, they very well may be locally made sausage and generally have their own special blends of spicing. I think it’s fun to be a little surprised by a variance in spicing that really stands out. The “off brands” are generally priced lower, not because they’re inferior, but because otherwise, they can’t compete with the big guys. Preheat oven to 425 degrees F (220 degrees C). with a metal pan of water in the bottom of the oven. In a large bowl, sift together the flour, sugar, baking powder and salt. Cut in the shortening, using a pastry cutter or two knives until the mixture resembles coarse meal. Add milk and stir in using a spatula, until dough pulls away from the side of the bowl. Turn out onto a floured surface and with floured hands, gently push and pat the dough forward into a rectangle about 8 inches wide and about 5 inches high. Fold over the long end on itself. Turn and repeat about 15 times, working very gently and patting out and turning each time. Pat dough out, the final time to the rectangle, about 8 x 5. Make sure you can get six biscuits out of the dough. The dough should be pretty close to an inch high. Use a 2 1/2 inch cutter and cut out six rounds, cutting straight down. Be careful not to turn the cutter and do leave a bit of edge around the outside of the rectangle. If you wish to reuse the scraps, don’t “smoosh” them together. Instead, lightly stretch them and place them one on top of the other in a stack, Gently press down and out to a rectangle the same height as the rest of your biscuits. Cut two more rounds and use the last bit of scrap for a final biscuit, making a total of 9 biscuits. Brush off any excess flour. Place biscuits onto an ungreased baking sheet about 1/2 inch apart and bake for about 12 to 14 minutes until edges begin to brown. Remove and serve immediately, while still warm. Note: dough may be made up to 24 hours in advance and stored, refrigerated, in plastic wrap sprayed with cooking spray. Add sausage to a medium sized saucepan. Slowly heat over medium-high heat while breaking up the sausage into small pieces. If sausage is very lean, a little oil or butter may be needed. Cook until sausage is no longer pink and lightly browned. Don’t drain the sausage. Sprinkle flour over sausage and continue to cook for a minute or two, stirring, until the flour is all incorporated and has lost its raw taste. Gradually add milk, a little at a time, whisking or stirring. Cook, stirring often until the gravy has thickened enough to coat the back of a spoon and doesn’t fill in when a finger is run through it. Add salt and pepper to taste, being very generous with the pepper. Add a pinch of red pepper flakes, if desired. If serving 4 people, use the smaller amounts of flour and milk, if stretching to serve more, use the 1/3 cup of flour and 3 cups of milk. Gravy may need to be thinned if standing for a while or when reheated. I’ll be sharing my Classic Biscuits & Sausage Gravy this week at Fiesta Friday 235, hosted this week by Mara @ Put on Your Cake Pants and Hilda @ Along the Grapevine. Don’t you just love both of those blog names? Click over and take a peek – I think you’ll love both of their sites as well. Mara has a gorgeous blog featuring more than just cake (although I think she excels at dessert) and Hilda’s blog is full of wonderful, natural recipes and sustainable hints. You’ll never look at a weed, plant or flower in the same way, again! This entry was posted in Click here for Bargain Meals, Click here for Fabulous Food Posts and tagged Biscuits, Breakfast or Brunch Dish, Country Gravy, milk, Sausage, shortening, Southern Cooking. Bookmark the permalink. Yummy, Can I have these in breakfast with coffee. Hi Adrina, thanks! Anytime is a good time for Biscuits and Gravy!! Just seeing your pictures is making me hungry! I love biscuits and gravy but my husband despises biscuits. Can you even?! He’s getting leftovers for dinner one of these nights so little Dude and I can have biscuits and gravy! OMG! You use shortening???? 😂😂😂 just joking! lol, Elaine, I feel guilty just knowing you saw it! That’s because you inspire me! Ha ha ha!!! You’re so funny 😃😃😃 if you enjoyed them, that’s all that matters! Thanks so much for hosting for us!! I think I first saw it at an after bar party back when I was in college! As a Southerner I have to say well done! This is like mother’s milk to those of us who grew up South of the Mason-Dixon Line. Nothing can make a morning better and more comforting. Great post. Thanks so much Teresa! I will take that as an endorsement, lol!! Hi Ron, give it a try and be very gentle with it! I’d love to hear back if these biscuits are the one! I’ve never had bacon gravy, but I know I’d love it! Thanks for the tips on making perfect biscuits, especially about the water. Makes total sense. As for not using butter, I’m not at all surprised. I use home rendered lard which works really well, but will try the water trick next time. Hilda, I was thinking about lard when I was making these! 🙂 I don’t really make lard but I do save it up as a byproduct when I’ve made a roast but I always use it in my tamales. I have a friend who uses lard in all his pie crusts – they’re super flaky and taste fantastic. Oh Jheez, it was late when I wrote this – I should have mentioned all your tips are great! It was the water that really stood out for me~ I made these twice yesterday (actually more than twice coz I forgot the BP the first time!) and the ones with the water WERE higher! So that tip REALLY stuck in my mind. I’ve never heard it, although I do it when I bake some breads. this sounds and looks delicious, but ……I can not make this here in India. For one rarely any pork sausages available and when then the taste is very questionable and then shortening also I can not get. So – I just enjoy reading your article and looking at those lovely pictures and imagine that you just served me a plate with this. Thank you. That’s a beautiful compliment, thanks. I wish I could serve you a plate. I will stop over because I’ve been missing you! We had a cold spell, we were down in the 60’s * 50’s but now two days of rain and a heck of a thunderstorm and it’s so hot and humid it’s unbearable. I guess we’re paying the price for two comfortable days! I LOVE biscuits and gravy! Shared on both of my Pinterest pages. Hi Robin, thanks so much! I really appreciate it! I’m gonna find your pages and follow. I’ve been slacking off on my pinterest lately. That’s what I think, too. Wallpaper paste! You can buy that by the bucket!